The game play is weird....I dunno, I know I will adapt to it, but yeah. I really am impressed with the graphics on it too! ^Glad you like it so far. I was wondering if anyone else here was playing this yet. Yeah, the gameplay took me a while to get fully comfortable with; I think it took me up until around chapter 3 to fully grasp it. The reason was that I have never before played a RTS game in my life, and since this game is some sort of RTS/RPG mix, well you know... I was pretty bad at this game at first too. I think I died like 4 times on mission 1-4. I still haven't beat it yet, but I'm almost there; I just started Chapter 9. I think the story's not too bad, really; probably because my expectations of it weren't all that high to begin with. So, overall, I'm quite pleased with the game. Hope you continue to enjoy it RB; the beginning was the hardest part for me, really, with only a few missions later on that were really challenging (but I guess I'll see what the last two chapters are like). yeah, I died about 4 times as well, I finally got pasyt it though...twas a pain! I like it so far, really fun! When you finish it, RB, you'll have to give us a review. ^I hope you get a DS, (as well as FFXII:RW) GRG2! 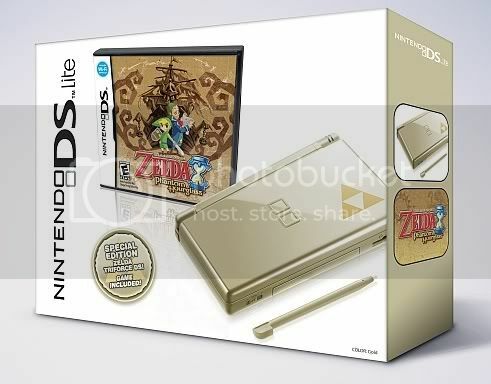 That Gold Zelda DS looks really neat. A friend of mine was talking about getting it, and it would be neat to have it myself... but I already have my original white one (and that's all I need really). I kind of wanted to give a review of the game myself, since I have finished the story now (still doing side quests). But, I have never done a review before, so I'm not sure how well I could do it. Grg2, I think you should just tell your bf to look at ffxii.net, especially the Final Fantasy section. That would be really subtle. ^Just do it. Im sure it'd be helpful and good. Wow, that looks awesome Grg! I want the zelda games as well, and EB, reading your review now! There are several games for the DS I really want....I saw a thing FFVI, and I never played that one before...have any of you? If the FFVI DS is true to the original SNES version, it is a must buy. FFVI was my first FF game, and my first RPG. The storyline is wonderful, the character development is incredible (you'll find you identify with every character, and there is some true "tear-jerker" scenes), and the best villain in not only any FF game, but any game period. You'll love it. FFX is my 1st favorite FF game, but FFVI is easily my 2nd favorite. Eh How is the story..? IS it just like Wow beat the bad guy or is there complications and character interaction!?! BTW. The is FF6 GBA which is a portable version. You can play it on your DS. There is FF3 DS which is ok. FF4 looks awsome. I'll add some other good looking games if ya like.. I am sooo excited to play it!!! Don'tcha wish your mooglefriend was hot like me? ~ PushyCaitSiths. How come it is broken? FFVI aint coming to DS. Yet. I hope its on PS3 though. Erm it just stopped working so it got broken by someone. And I said that because earlier on people were getting confused. Only FFIV is confirmed for the DS. Not FFVI. I never heard of the FFVI remake for DS. Sorry about that, I was confused. Concerning FF XII RW... I can't wait for Friday ! I should buy a DS Lite, and the game of course ! ...It is because there is a limit to time that we wish for nights that never dawn.